What can I say; the apples keep getting greener! 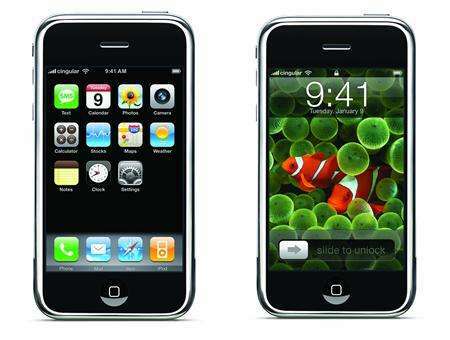 Apple Inc (the new name) unveiled its new iPhone and AppleTV yesterday as the stock was up over 8%. As you all probably know by now, it’s more than just an 8 gigabyte iPod mobile phone with a touch-screen. It looks great; sharp and sleek with internet capabilities that have me salivating. One problem for me though: I don’t use Cingular and I am not changing my carrier because my service has been excellent for five straight years so I’ll stick with my razor and traditional iPod for now. 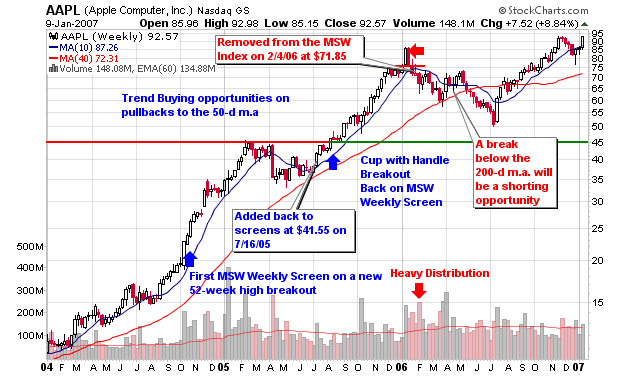 Apple Computer (AAPL) has been cut from the MSW Index as it violated the support line on volume 100% larger than the 50-d m.a. with a 6.33% drop. I hope many of you also cut your positions when the red flags started to pile up. If not, I strongly suggest cutting the stock and locking in profits before the stock drops further. NOTE: the stock dropped 30% over the next five months and took more than eight months to break even but it did. It is now almost 30% higher than the violation date back in early 2006. I would be showing a larger profit if I were a buy-and-hold investor but maybe I would have never bought LVS in April without this Apple cash. I just can’t watch a position go against me no matter the long term results. 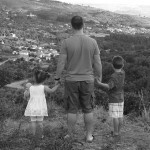 I don’t buy and hold – maybe some day! 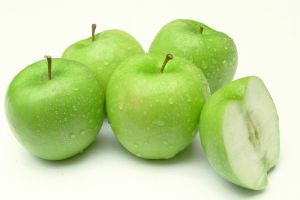 One of my earliest blog posts was about Apple back on January 13, 2005 and I titled the post “Green Apples”. 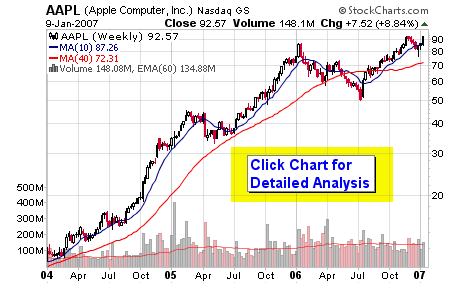 I followed up that post with one titled: All-Star Stock – Digesting Apple on January 17, 2006. It’s a great company and a great stock, let’s see where it goes. Disclosure – I do not own shares in Apple and I don’t plan to buy in the near future. The tip-off for AAPL was Dec.27. The pattern from late November to Dec.27 was a classic drift & spike pattern. You buy the stock once it takes out the spike day high which was Dec.29. I concede it gapped on Dec.29, but as a rule you can buy the gap if the pattern is perfect. In the case of AAPL it was a perfect drift & spike pattern. I have found this pattern to be a high probability situation to get into a leading stock that trends downward for a while. I bought Apple back in July when it gapped out of its downtrend, at 60.63. I feel really proud of myself for that buy. I took some partial profits when it retraced a portion of its gains. It retraced 30% (from 91 to 81) so I sold almost half of my position, because that’s what my rules say to do in order to preserve gains. But, I really wanted to buy more, the pullback was an opportunity to load up. I still plan to hold onto it for a while. Maybe instead of selling next time, I’ll buy puts instead. That might be a plan for cashing in on pullbacks.